Home News/Essays Is U.S. Nuclear Weapons Strategy and Foreign Policy/Militarism Risking Nuclear War? I believe that this U.S. attempt to gain nuclear weapons primacy is a catastrophically dangerous impossibility which makes hostages out of all of us, and threatens the destruction of the Earth’s biosphere. Any thermonuclear strike would cause unimaginable death and environmental destruction from the blast, heat and radiation, affecting the entire world. A December, 2013 report by Physicians for Social Responsibility estimated that a nuclear war between India and Pakistan using only 0.5% of the world’s nuclear weapons would put two billion people at risk of starvation. The only sane nuclear war strategy is prevention. Nuclear weapons confrontation is the great equalizer. Even a single nuclear weapon could cause crippling destruction to any nation. As Lieber and Press note, neither Russia nor China can keep up with the expensive U.S. proliferation of nuclear weapons and delivery systems. However, they can prepare a few weapons which could survive a nuclear first-strike and destroy the United States. The reality of high-altitude nuclear electromagnetic pulse weapons, designed to destroy all computer chips in line of sight of the blast, is completely ignored by the strategic analysis presented by Lieber and Press. 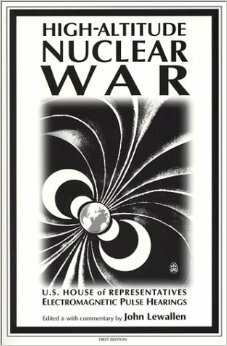 In 1997, hearings held by Representative Curt Weldon in the U.S. House of Representatives revealed that the U.S. and Russia both have developed a top-secret arsenal of nuclear weapons designed to “lay down” a powerful electromagnetic pulse, destroying electronic civilization on Earth and in space over huge areas. Nuclear electromagnetic pulse weapons could be deployed in satellites, which need not be accurate to cause massive destruction of computer chips. There is no nuclear first-strike strategy which could protect us from high-altitude nucear electromagnetic pulse attack. Perhaps the most frightening misconception in the article by Lieber and Press is the assertion that “The United States has a first-strike capability against China today and should be able to maintain it for a decade or more.” China under Chairman Mao began a top-secret nuclear weapons program after the U.S. had threatened China with nuclear attack three times. China’s nuclear weapons strategy is intensely focused on preventing nuclear threats from the United States. As described in China’s Nuclear Weapons Strategy: Tradition within Evolution (Lexington Books, 1988), Chinese nuclear strategy is informed by the ancient Chinese classic, The Art of War by Sun Tsu, emphasizing secrecy, deception, and the development of economic interdependency with the United States to avoid nuclear war. China almost certainly has a lot more nuclear strike ability than the eighteen nuclear missiles kept unfueled in silos which they have revealed. With the United States now entering a more confrontational mode with both Russia and China, it seems vital to global survival that we all study ways to keep this confrontation from escalating to nuclear war. All students of nuclear weapons strategy agree that if there actually is a nuclear war, the nuclear power which strikes first will gain overwhelming advantage. Though few believe that banning nuclear weapons is a realistic possibility, there are many words and deeds which move the world’s nations either away from, or toward, actual nuclear war. I believe the U.S. should renounce first-strike nuclear warfare and abandon its suicidal attempt to achieve nucear primacy by increasing nuclear threat, and move toward a world which accepts our oneness as a human race in the need to prevent nuclear war. John Lewallen edited and published the Weldon Committee congressional hearings on high-altitude nuclear electromagnetic pulse warfare in the book High-Altitude Nuclear War (Nuclear Press, 2002). His email is lewallen "at" mcn.org. "The United States has become the first country to disclose an up-to-date figure for the number of weapons in its nuclear arsenal... The US government had only made partial announcements about its arsenal before, revealing it had 1,968 operational warheads at the end of last year (2009).". Would a nuclear strike on Russia be suicide for the striker? A nuclear strike could crash their civilization? After the crash, would Russia be capable of performing maintenance on their reactors? Sounds silly, but nuclear power reactors won't run without external electric power. Would their electric grid go down? This would cause their 33 nuclear reactors to go Fukushima? If so, would the 15 reactors in the Ukraine be in danger too? With a functional civilization in Japan there still will be radiation leaking for who knows how long. With a nuclear attack on Russia, they may not be able to perform maintenance on their power plants and if their electric grid goes down it doesn't matter as it is all over. Now think about 33 nuclear plants in Russia that could go Fukushima and another 15 in the Ukraine that might go also. The attacker and everyone in the world could be in grave danger or worse. "Is the current U.S. nuclear strategy of seeking nuclear weapons dominance by developing and deploying weapons which increasingly threaten Russia and China with a nuclear first-strike protecting the United States?" No, it is making General Dynamics, General Electric, Raytheon, and the rest of the Mobsters of Death very, very rich and the rest of us very poor. The only possible place for nuclear energy use, might be outer space (preferably beyond Our Solar System) Personally, I am terrified of the harm potential of this horrible science on Our World!